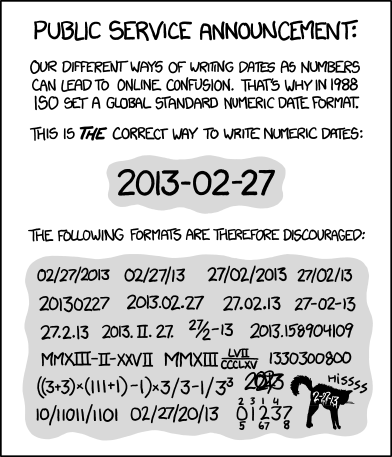 Doing the rounds is XKCD’s endorsement of the ISO 8601 date format. 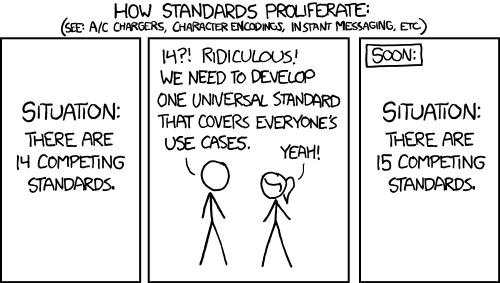 Let’s avoid that, because as another XKCD reminds us, you don’t just invent new standards in the hope of wiping out the old ones. 2013-02-27 is used by no-one; so it will confuse everyone. Real people don’t use leading zeroes. It’s still ambiguous. Given dates are already messed up, there’s really no reason to assume 2013-02-03 is the logical MM-DD order. Sure, if the context is filenames or something technical, use this format or just plain old 20130227 (it will sort nicely (https://twitter.com/CastIrony/status/307014830752149504)) and I often do use this format for backups. But for humans, stick to what they know. Plenty use this format (Microsoft and entire filesystems people use every day are built on it for sorting), but your comment sounds like an American saying no-one uses metric, when in fact pretty much the rest of the world uses metric except for the US. I prefer the YYYY-MM-DD format and have been using it for over a decade now. I know real people who use leading zeros. I know fake people who use leading zeros too. “No-one” is an exaggeration. There are some people using it, but I’m willing to bet there’s a lot less people using YYYY-MM-DD than people using metric, imperial, DD-MM-YYYY, or MM-DD-YYYY. Wiki says it’s about 140M people, so about 2% of the world’s population (going by official country formats, which is of course imprecise but a good guideline) http://en.wikipedia.org/wiki/Date_format_by_country. The main point is that you can’t make a dominant standard out of something very few people are using…it’s wishful thinking at best. YYYY-MM-DD is my preferred format. It sorts nicely, it’s easier to read than YYYYMMDD, and it’s unambiguous. (Nobody uses YYYY-DD-MM – see the previous Wikipedia reference.) It’s a great choice for a website with an international audience; initially it’s equally confusing to both MM-DD-YYYY folks and DD-MM-YYYY folks, but once accustomed to it, it’s easy for both to use. http://www.librarything.com (US based but with an international audience) uses it as the standard format for dates. I prefer using YYYY[-.]MM[-. ]DD on anything that will be sorted, like filenames and titles, and MM[-./]DD[-./]YYYY inline. I doubt we will make it a new “standard,” used by everyone, or even becoming “dominant”. I will be happy enough if it is used by “more”, for most values of more. I disagree that mere mortals will find ambiguity in it. A few might, but most will figure out right away that there is only one way to do it. So even if their “muscle memory” way of doing dates is dd-mm-yyyy, they will find yyyy-mm-dd to work for them when they see it written by someone else, either immediately or after a bit of research. It’s still the case that in a mixed international setting, absent unambiguous context, one cannot assume one interpretation over another when one sees 03/04/2013. Either could be correct. Whereas yyyy-mm-dd can be interpreted as the “correct” interpretation of 2013-03-04. Yes, there is a small chance someone wrote it the other way, but that could be a typo or dyslexia or just a local aberration, like an analog clock whose hands move anti-clockwise, more interesting for being an exception. Yes you can spell out the name of the month — but I only know the names of the months in a small number of languages, so it could take me a while to figure out what is meant, and besides, it is hard to sort. It would not ultimately be ambiguous, just inconvenient. Your point about it being yet another competing standard is more “cute” than helpful. I don’t think the ISO is looking to add an ‘n+1’th standard date reference every few years to solve the problem of “how to format dates so as to avoid misinterpretation of numeric representations of dates and times”. This is it. And it has been around since 1988 with no serious alternative suggested. No, it isn’t being used by enough people to replace the other, ambiguous formats. That’s not the point. The point is that when it is used, it works and works well (or at least as well as anything can for the crazy mixed up calendar used in western culture and commerce). I’m not sure slashes change the ambiguity as they tend to be fairly interchangeable with dashes in a human-readable date context. I would often avoid slashes in IDs though because they don’t go well in regular string IDs and can get mixed up with folder structure. e.g. an ID like transactions-2015-12-25 looks cleaner than transactions-2015/12/25 and the latter can cause problems in a URL context. I have never in my life met a person who uses the MM-DD-YYYY form. I only see it online, and then dominantly used by Americans.